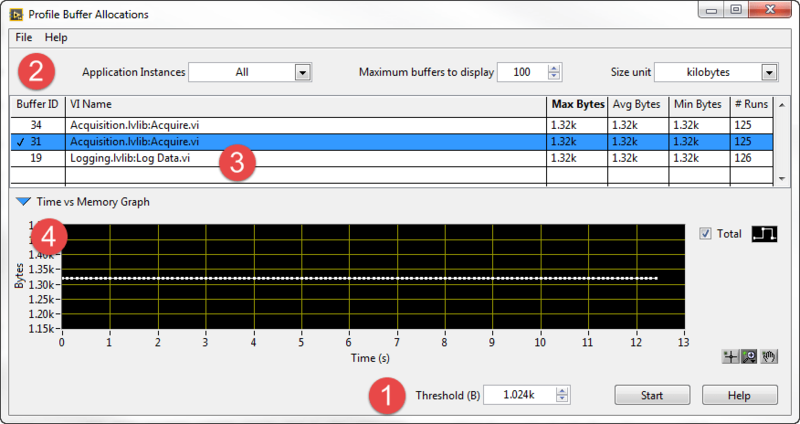 LabVIEW 2014 SP1 – Notice Anything New? It’s Spring! Which means it’s time for clocks to change, eclipses (well, that may have been a one off) and a service pack release from National Instruments. Although this is normally touted as a bug fix release, if you dig in to the readme though they have snuck in a nice new feature. The new feature is the Profile Buffer Allocations Window. This gives you a window into the run time performance of the LabVIEW memory manager that is otherwise hard to understand. Previously we only had a couple of windows into the LabVIEW memory manager in the Tools -> Profile menu. Show Buffer Allocations was the best way to understand where on the diagram memory could be allocated but it doesn’t tell us too much about what actually happens. Performance and Memory shows us the run time memory usage on a VI level but no way to track it down to the actual code execution. But now we can see more of this at run time. Launch the tool from a VI through Tools > Profile > Profile Buffer Allocations. Below you can see an example run of the Continuous Measurement and Logging sample project. Profiling Control — To confuse things slightly, the workflow begins at the bottom! Set the minimum threshold you want to capture (default is 20 kB) and press Start. Press Stop once your satisfied you’ve captured the data your interested in. Buffer Filters — The bar at the top controls the display of the buffers in the table allowing you to filter by Application Instance, restrict the number of buffers in the table and adjust the units. Buffer Table — The buffer table displays the buffers that were allocated during the run as well as their vital stats. You can double-click a buffer to be taken to it’s location on the diagram. Time vs Memory Graph — Once of the coolest features! Selecting a buffer in the table will display a time graph of the size of that buffer during the run. I can imagine this would be great in understanding what is causing dynamic buffer allocations by seeing the size and frequency of changes. I think anything that gives us more of a view into some of the more closed elements of LabVIEW has got to be beneficial, so go and try it and learn something new about your code. After declaring my intent earlier in the year on moving towards an increasingly test driven methodology, one of the first projects I aimed to use it on has been based on FPGA, which makes this less than trivial. I was determined to find a way to make the Unit Test Framework work for this, I think it has a number of usability flaws and bugs but if they are fixed it could be a great product and I want to make the most of it. So can it be used for unit testing LabVIEW FPGA code? Yes but there are a few things to be aware of. Falling at the first hurdle, creating unit tests on VIs under an FPGA target isn’t an available option on the right-click menu, normally the easiest way to create a test. Instead you must manually create a unit test under a supported target type but as LabVIEW FPGA VIs are simply VIs, you can then point this at the FPGA code as long as it doesn’t contain any FPGA only structures. This has it’s frustrations though. You must manually link the VI (obviously) and rename the test. This bit is a pain as I cannot seem to rename new tests without closing and re-opening the project. Re-arranging tests on disk can also be a frustrating task! Unlike processor based code, FPGA logic generally works on data point by point and builds an internal history to perform processing. This means you may have to run the VI multiple times to test it well. The test vectors function of the unit test framework allows you to do this, specifying inputs for several iterations of the VI and being able to test the VI over time. Related to 2, because FPGA code commonly uses feedback nodes/feedforward nodes/registers to store data at some point that has to be reset. The lazy route to this is to simply wire inputs to the feedback nodes however this defaults to a reset on first call mode. This won’t work with test vectors as each iteration is counted as a new call. At a minimum you should change the feedback node behaviour to initialize on compile or load, but better practice on FPGA is to have a reset input to the VI to allow explicit control of this. Then you must simply set this on the first element of the vector to get the expected behaviour. There will be code that the UTF can’t test directly if it can’t run under an Windows target. In this case the best way to include it in automated testing is with a user defined test. This allows you to create a custom VI for the test, which can include a FPGA desktop execution node to allow for testing the VI. Potentially this will have to be accompanied with a custom FPGA VI as well to be able to pipe the correct data into FIFOs or similar. Hopefully this will help you get over the first few hurdles, I’m sure more will follow and I will try to update them here as I find them.